I’m a Jersey girl in Barcelona, working for a company with offices in Minsk (two hours ahead,) South Carolina (six hours behind,) and San Francisco (nine hours behind.) This means my work day can be often scattered, is spent completely behind a computer, and filled with distractions — those tempting all around my home office and pressing matters popping up in my Skype window all hours of the day. Yes our R&D team’s first language is Russian, but that doesn’t seem to be the language barrier we most often come across. The problem is that I’m a Luddite and naturally resistant learning new technology. But, as you’ll know if you work for a tech startup, or any startup really, that doesn’t fly. Since we produce, market and sell two productivity-enhancing apps, our staff is obsessed with trying every other productivity app. But I’ve worked through it and actually have found benefits — not always the intended benefits — from many apps. I’m a consummate multitasker, and yet supposedly that’s an impossible oxymoron, but apps have enabled me to live in a world of systemized chaos. Because of these tools I’m going to share, I’m able to work remotely on a team with 11 hours of time difference and succeed at the inevitable multiple and constantly changing roles that come with working for a startup. All done without losing my mind. I use Hootsuite, more than anything, not because it helps me schedule our social media — which is very helpful too, especially in building client loyalty — but because it keeps me off social media, namely, those timesuckers: Twitter and Facebook. I can see everything that’s going on with our work social media, schedule everything in advance, and make sure there are no concerns out there, while avoiding the time quagmire by never actually opening Facebook or Twitter. My name is Jen and I’m a tab-aholic. I usually have about 25-50 tabs each open in Chrome, Firefox, Safari and phone. You know when you reach that point, you can’t read them anyway and it becomes too much. The free Trello app is great because I can simply lump everything together and organize my personal and professional life on one drag-and-drop screen. It gives me a place to virtually vomit all the random ideas that pop into my head, any time of day. With Trello, I can make a more readable To Do list, and then I can drag them into different stages of started and finished. First, I don’t research technology before purchasing. I’m quite gullible. If one person I trust says it’s good, I trust them. That doesn’t always work out, but thank goodness it did with my Google Nexus LG smartphone. In this case, my man researched smartphones that could come unlocked because as an expat, it’s challenging to get a contract and, well, life is unexpected so I don’t want to be tied down. Here in Spain, prepaid phones are really common. He decided we should buy so-called Google Phones, and I’m in love (both with him and the phone.) Instead of Microsoft Office and SkyDrive, my company lives in the Google Cloud. The Google Phone, as you would hope, is simply amazing for Google Drive, allowing me to squeeze in editing and writing work from anywhere, even while I’m carefully walking on the street. (Ahem like now.) The spell checker is an intuitive dream that customizes to my writing style. My personal, work and gym calendars all meld together, so I don’t double-book, and I actually use GooglePLUS, which we all know is essential for SEO and Google authorship credibility, but is just so hard to get into the habit of using. Don’t you love it when all your apps play together? As you may have guessed, I’m super into seamless integration because, well, I don’t want to do extra work. That’s why I was so excited when Zapier decided to integrate with Quote Roller. That means that our business proposal app that already deeply integrates with more than 30 apps, can now give our clients the opportunity to streamline Quote Roller and Zapier with an incredible 250 other apps! Plus, as I’m trying to learn Unbounce and other apps that interact with our website, Zapier is a crucial link in that process. It’s as simple as a couple clicks and a zap. Simply log into your Zapier account and click Make a Zap! 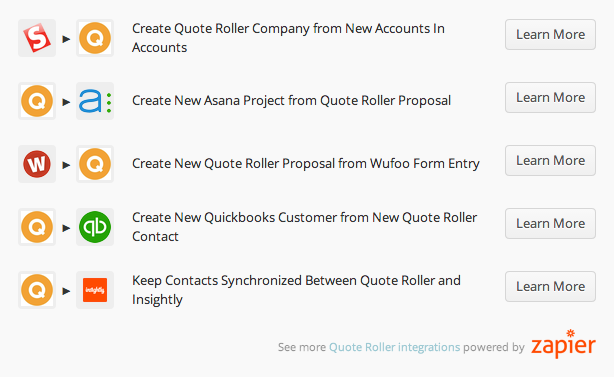 The first time you choose Quote Roller as either end of your Trigger, it will ask you to log into Quote Roller. 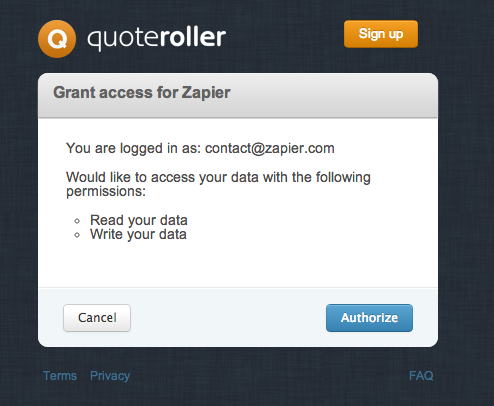 It will then ask you to Name your Quote Roller account, as you might have multiple Quote Roller accounts, but only one Zapier or vice versa. Then it’ll pop you over to Quote Roller to Authorize your account. Then your Quote Roller will be integrated with your Zapier until you Disable the Integration or perhaps clean up your cookies. Once you’re all integrated, you can choose any of the apps in the left to Trigger something in the right. 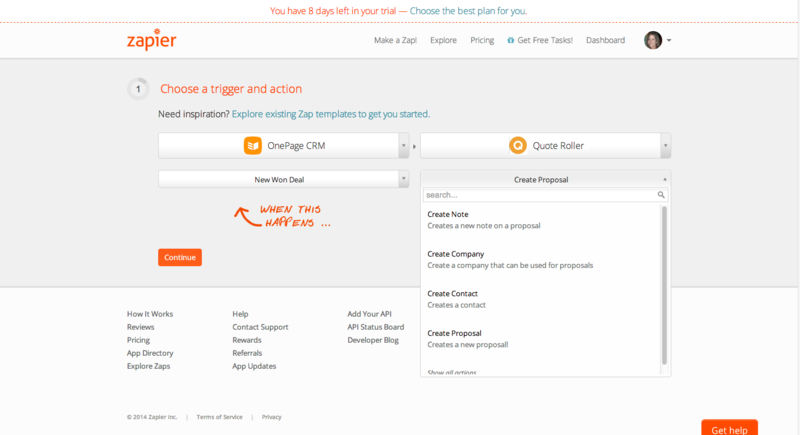 In this example, while you can simply click a Q in your OnePageCRM when you want to create a Quote Roller proposal from a OnePageCRM deal, now you can set it up that as soon as you’ve won a deal, Quote Roller goes ahead and sends a proposal. It follows the classic logic of an If This, Then This statement, but in your technology. And here are some more ideas that the folks at Zapier thought of! The opportunities are quite endless, so jump right in and give it a go! And don’t forget the obvious gateway to productivity! Mute your smartphone and close your email for the first hour of the day. Sometimes, I even do this for the first half of the day. You know what you have to get done and as soon as you open your email, you know you’re either not going to get it done or you’re going to be staying late. And of course, as a friend suggested, you could stop spending so much time searching for the next productivity solution and just get it done! How do YOU use Zapier? How will you use Quote Roller + Zapier? What other tricks do you have for productivity?